After decay is removed from a tooth, something must be placed in that space to give strength back to the tooth. Fillings are the most common restorative procedure. Our office uses white, metal-free fillings because they are strong and cosmetically more pleasing. There is much debate about the safety of mercury fillings. Since a better alternative is available today, we choose to only offer white fillings. The color can be matched to your existing tooth color for a perfect result. When you have a white filling, no one can tell that you have had any work done. We want your smile to be functional and beautiful! in-office filling, which is necessary in certain areas. Dr. Toomey may also use a gold filling on a back tooth. This is because gold is the strongest material and your back teeth absorb the most pressure in your mouth. If he uses a gold filling, it can be hidden under a white overlay, so it is not seen at a glance. The gold may show slightly, and that is why we only use them in the back of the mouth and not on front teeth. White fillings are an alternative to silver (amalgam) fillings. White fillings are made of a strong composite resin that is matched to the surrounding tooth color. In the past, white fillings were placed only on front teeth, but a stronger, more durable material has been developed that can withstand the chewing pressure of back teeth. 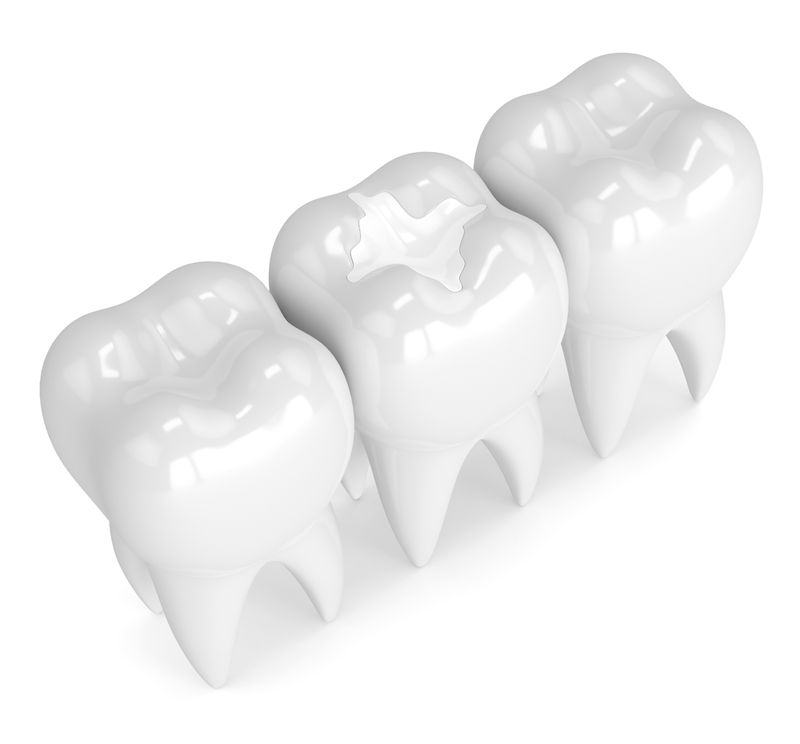 A porcelain inlay or onlay is used when the cavity is too big for a filling, but isn’t so big that a crown is required. An inlay is a filling within the cusp tips of the tooth. Onlays (also known as overlays) will cover one or more cusps, in order to protect and strengthen the tooth. An inlay or onlay may also be made of gold. Gold is used because of it’s strength. It also does not oxidize or discolor the teeth. 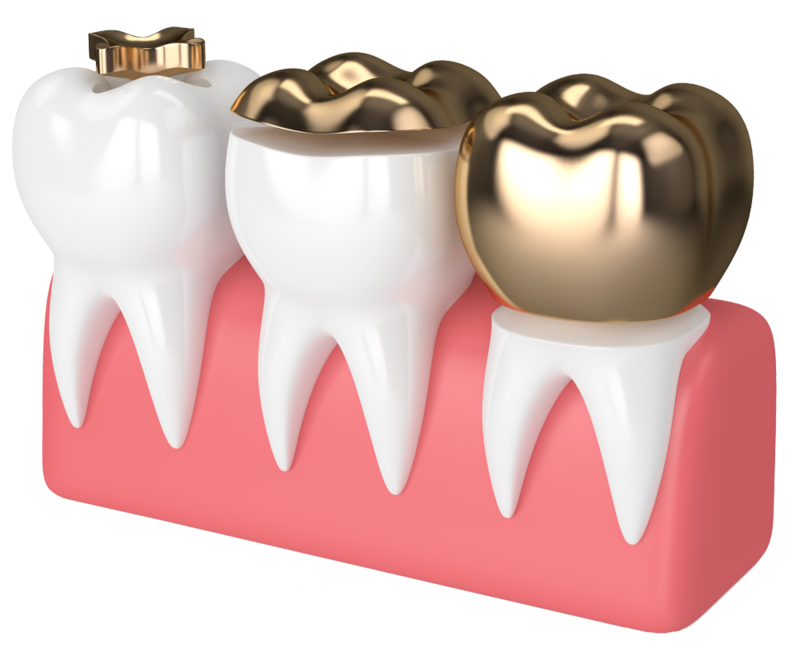 On back teeth, Dr. Toomey may use a gold filling, in order to give more strength to a heavily used area. It can be hidden with a white porcelain covering.